ALL NEW SCHEDULE FOR 2018-2019! Students are given a range of ready shot projects which they then use to create while studying the processes and techniques involved in editing on Adobe Premiere In this project based course students will explore Adobe and learn how to navigate the software, learn awesome movie making tricks like pacing, keyframing, masking, color correction, and much more in this interactive classroom. This class is recommended for students between the ages of 12-14. 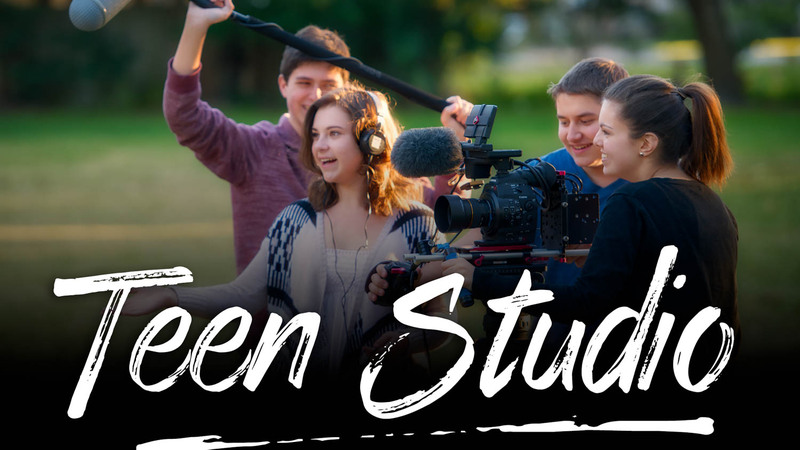 Students experience new challenges and film gear while learning to film, edit and produce original films. Levels of equipment change throughout the course to prepare students for our pre-foundations and foundations courses. This 2 hour class teaches students how to create compelling characters, drawing fundamentals, color theory, page design, story design and much more. We recommend a 2 hour experience so students can have one on one instruction from their instructor and dive into their creative process. The class projects will be designed to show students the professional art process for film, animation, graphic novels, and video games through hands on application as student’s build their portfolio. In this 2 hour weekly class, students will go from dreaming up and sketching out their game level idea, to blocking out and play testing their rough level design, to creating a fully finished packaged Game Level that can be installed, played and shared with friends! Students are filming on a variety of camera gear, using external sound mics, editing and producing original festival quality short films as they learn the art and craft of filmmaking. This course will be focusing on how professional storyboards and characters are created for movies, animation, video games, and graphic novels. Students will learn advanced anatomy, advanced character development, fashion design, advanced visual storytelling, visual layout, storyboarding, advanced character design, character outline, and story development. This course is advanced and students will be developing their own intellectual properties. Journalism X & Photography may also include field trips to off site venues for stories & news gathering. *Depending on field trips, there may be additional minimal costs. This class embraces film studies, covering film language, theory and history, however, we’re adding a twist. Students will use super 8 cameras and hands on editing to apply the theory to practice. Foundations Classes are by invitation only. Rising Stars Filmmakers class is by invitation only and taught alongside Foundations using advanced camera and audio equipment and more complex stories and workflows. Students create original festival level short films as they learn the art and craft of film making. Note: Foundations classes are by invitation only. This “master class” style experience allows students to explore different mediums in this project based course. Challenges like producing “wearable art”, custom props, cosplay costumes, body paint, street art, airbursh art and tons of other mediums will be covered in this class. All levels welcome! Tuition also includes supply fees. In this specialty class, students learn a variety of make up techniques while using special effects make up to create their characters. Prosthetics design and advanced supplies and materials are included with this experience. All materials and supplies are included with tuition. This is a very popular class at FFA, so be sure to grab your child’s spot quick! This one of a kind acting experience includes coaching in improvisation, acting for the camera, voice work, audition techniques, learning how to perform on camera through monologues, scenework and more! This course will focus primarily on visual storytelling and how it specifically pertains to children’s books and graphic novels. Students in this class will learn industry techniques of how to construct preliminary sketches, page layout, dynamic visual design, and visual storytelling. The course will also focus on working with students in developing their own unique graphic art style and technique. This in depth course will cover curriculum in our Intro to Visual Effects course. Students are also introduced to digital matte painting, creating epic digital environments and set extensions using Adobe Photoshop, Adobe After Effects and green screen, how to create model miniatures and film them to look like the real huge thing (helicopters, airplanes, robots, tanks, trucks, mountains & scenery and more!). We’ll also explore how to create in-camera environmental FX (fog, wind, rain, ice, snow, underwater and surface water practical special effects), create Split Screen & Crowd Replication Effects, how to appear in a scene to be interacting with yourself, many clones of yourself, creating a whole crowd of people with only a few to fill your arena using podding and how to use camera, lighting and green screen visual effects to put yourself into any movie. Like all of our courses, our rotating curriculum builds on course skills throughout each school year.